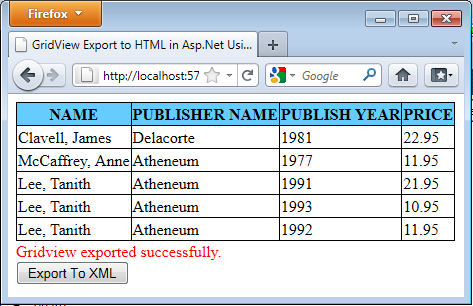 This article will show you how you can export the gridview control to XML file using C#.net in asp.net. In this I will show you to export the file in a folder in the root directory present in folder. Some of my previous articles are as follows: GridView Export to HTML in Asp.Net Using C#.Net and VB.Net, GridView Export to CSV in Asp.Net Using C#.Net and VB.Net, GridView Export to Word Document (.doc/.docx) in Asp.Net Using C#.Net, Code to Export GridView to PDF in Asp.Net Using C# and Vb.Net, Drag Drop Cells in GridView Control Using Asp.net C# and jQuery, GridView With Autocomplete Textbox Using AutoCompleteExtender in Asp.net Using C#.Net. So for this article first we will first we will create a new asp.net application and add the gridview and a button control. Now we will check the code for exporting the gridview into xml. In above code I have first bind the grid view code and then on button click event I have written code for export the code into xml. Now run the application and click on export button you will get the success message. Now check the XML folder present int the application. 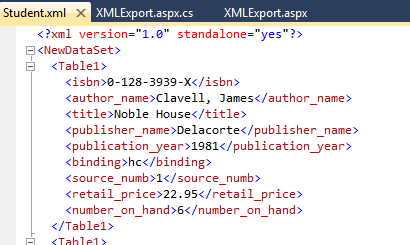 Now open the XML file to check the output.